explain a mystery that cannot be explained? Those of you who weren't able to attend Marks presentation to a Shabbat group on Friday, Dec 13th missed a great discussion about The New Advent and End/Beginning Times. But wait, you didn't miss it, you've got to ask for it! Email MarkC91754@comcast.net and I'll forward the audio file directly to you. I'd love to hear what you think! What if there is only one constant in the universe, and we can’t see it? In this thrilling novel Mark Cornelius broaches the topic of end times and vividly shows what the human race would do if unable to deny the coming of the last days. Danny’s growing faith in the face of certain catastrophe and his observations about science and intelligent design make this a compelling read for both the doubtful and those who believe. The true scientific theories portrayed in The Singularity allow you to peer into a not so distant future that is far different than any of us has considered. Danny will help others see a possibility contrary to common thought. What if God is in control of the universe and has a plan in which humans play a crucial role. 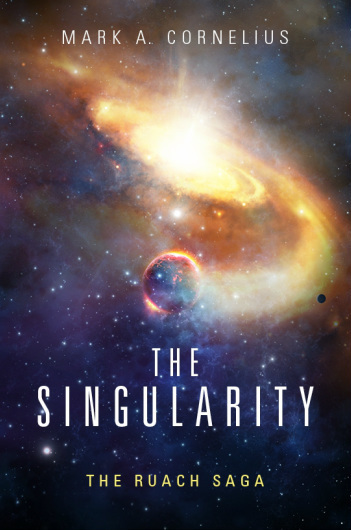 The Singularity will keep you engaged with its tight plot and fast pace. Most exciting book on end times I've read! This includes "Left Behind" series. "Best book I've read all year! Great Art. Can't wait for the sequel!" The book held me captive from start to finish. As a Christian I appreciated how each character was portrayed on his or her journey of faith especially as they were faced with the reality of the end times. -Tommy W.
I fiinished the book last evening, and was very moved by the story. Integrating the idea of quantum theory and the singularity with fundamental, literal Scripture interpretation was very well done. The characters were very real and the writing drew me into the story. Parts of the story brought me into personal devotional time and reflection. A very good read for everyone! - James A. Thank you Mark, great book! Definitely digging the book so far. Love the line about the “fact that someone wants me as I am, is enough” is pretty piercing and congruent to God’s love…least how I took it lol so far so good sir. Charles C.
I just finished reading this book and i must say that it is one the most interesting and compelling books about the coming apocalypse that I have ever read. I appreciate the scientific approach and the fact that it is intellectually stimulating. Most boooks about Jesus return bombard you with scripture without giving the reader an accurate picture of what the days will look and feel like leading up to the rapture. In short, this was an excellent read! -Chuck B. See The Singularity trailer at /uploads/2/0/7/1/20715426/m.cornelius_low_tr.mp4. Then go to my contact page and let me know what you think.